A scripture found in Isaiah is one that I am often reminding myself these days. I've shared before how I am a planner. I appreciate a well thought-out plan or schedule. Ironically though, I need flexibility in my life. That flexibility is something I have learned to include when I plan. Sometimes the Lord only shows us a small portion of the plan. When this happens, life's circumstances and events do not seem to easily fit into that plan. But He is God. 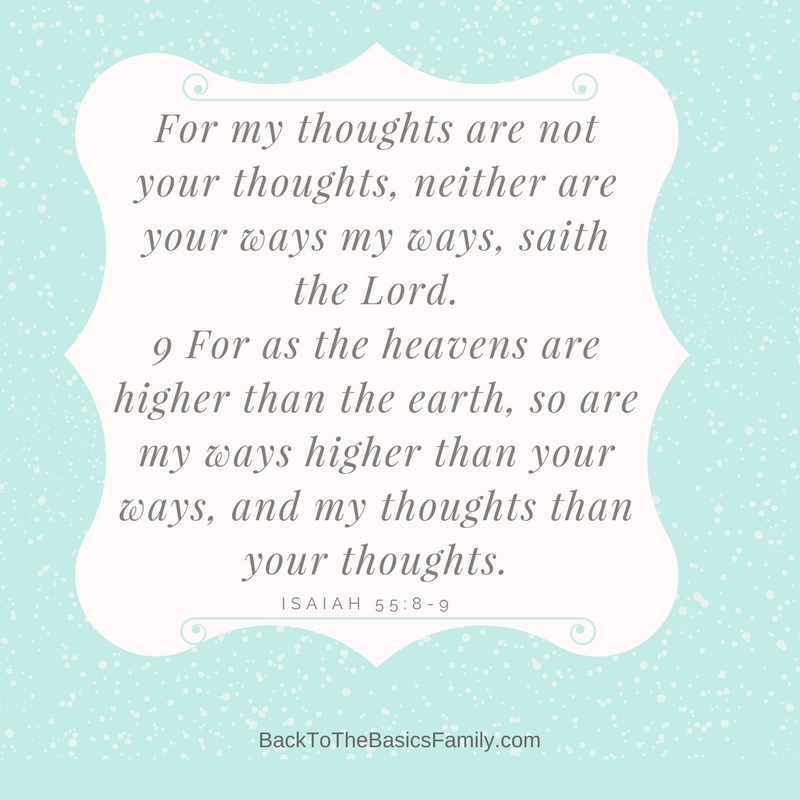 His ways are higher than our ways. Praise God! In the middle of writing this post, I received a phone call from my husband, informing me that the company he works for is shutting down. Two years earlier, my husband was permanently laid off from the same company after being there almost 12 years. The Lord poured out blessing after blessing on us during that time. Through circumstances that could have only been laid out by God, and two other rounds of unemployment, we are faced with similar circumstances yet again. See, God's timing really is perfect. He has an orchestrated plan. Knowing this gives hope, Not dread. Is it always easy? No. 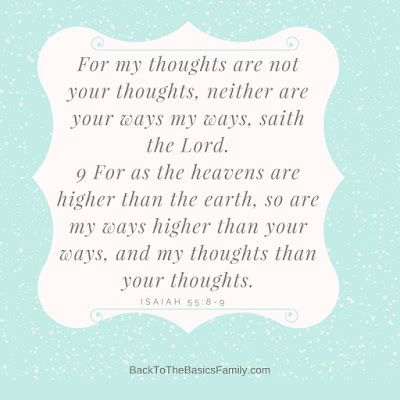 Daily, sometimes multiple times a day, I have to remind myself of those verses in Isaiah, leaving me feeling confident and thankful that I do not have to know the entire plan to trust that God loves me. That He cares for me. That He knows what is best. Lord, lead me in your ways. Give me boldness to follow and accept your ways. Use me, Lord, for your honor and glory. Let me be a light for you. Breathe a little easier today, my friend. Rejoice in the fact that your God already has the plan all laid out. That issue at work - He already has it covered. Trust Him. That next step in your ministry - Yep, He knows what is coming next. Stay focused on Him. He will show you at the right time. That situation with your child - God knows every detail and what is needed. Give it to Him. That discussion you had with your spouse - He has a plan for the two of you. Follow His lead.